Highland Park Movie Review - Are You Screening? Indie films are often a treasure trove of great writing, clever comedy, and realistic statements on the world that, for one reason or another, aren’t the sort of projects that can deliver a wide enough demographic to recoup the budget of bigger efforts. This is especially likely to be the case whenever you run into a smaller film with Parker Posey in it. Throw in Danny Glover and Billy Burke, and you can expect to be in for something interesting. Highland Park doesn’t quite live up to those expectations, but it’s an interesting effort nonetheless. It’s also one that, given the right proclivity for entertainment, is probably a lot more enjoyable than most releases. If nothing else, there’s something to be said for spinning things along a path that doesn’t entirely make sense, thus giving it at least an element of unpredictability. Our focus is a group of teachers and other staff at a school in Highland Park that is falling apart, which only means it fits right in with the neighborhood. A well-worked intro to the film shows us the history of Highland Park, once a small “hope for the future” community that was meant to be a kind of beacon for the surrounding area, the neighborhood is now utterly rundown, and in serious danger of losing the civic elements that aren’t already gone. As you might expect, we’re given to understand that much of the neighborhood’s downturn comes by way of corrupt politicians and their underhanded deals with big business. This comes to us via Parker Posey’s mayor character, a slight, but fun turn for her as a kind of kooky villianess. But, our story here is mostly about the group of teachers, and the connection they have as a lottery group. 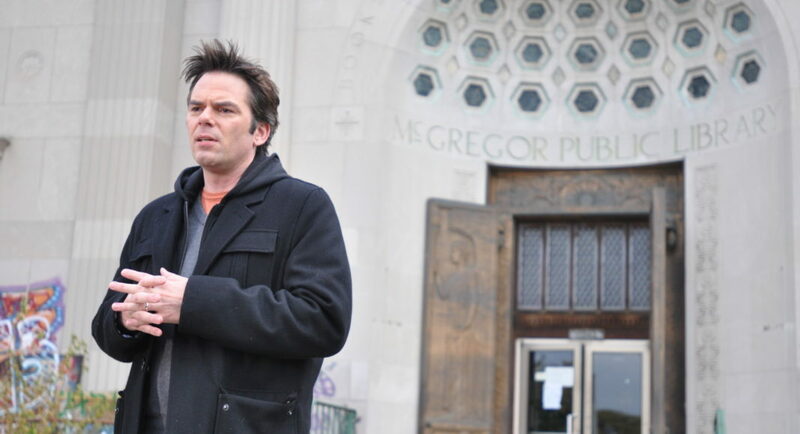 Billy Burke plays the principal of the school, and the cohorts in lottery hopefulness are longtime teachers, the football coach, and Danny Glover’s maintenance head, who doesn’t even actually work for the school anymore. The group of lottery players, spearheaded in some sense by Glover’s character, has been playing the same numbers since the ’90s. Finally fed up with the ludicrous redtape he has to deal with, and a new set of budget cuts imposed by the mayor, Billy Burke forgoes the lottery this week, and decides to refocus his life on more rational pursuits, like trying to save all of their jobs. You don’t quite have the lay of the land as far as how the rest of the film plays out, but you’ve got enough to know where you are. The first writing/directing effort of Andrew Meieran, the film frequently shows that this is a freshman work. Not only because it pushes so little that it negates most of what it is trying to say, but also because most of the talent is largely wasted. The characters, especially that of the mayor, feel out of place during most of their screen time. At certain points you get the impression that we’re going for something almost hyperbolic, such is the grandiose nature of the mayor’s attitude and affect, but this is contrasted by other characters and other moments which give us a straightforward attempt at honesty that leave us wishing hyperbole had a worthy antonym. That said, the film certainly has its moments, and you aren’t going to go too far wrong throwing Danny Glover into scenes that fairly ooze with an overabundance of gravitas, even if it is an overtly melodramatic variety. Posey is worth watching, if only because she seems to be having such fun with her character, but she doesn’t get the chance to carry things far enough to pull the film along. Overall, Highland Park is pretty entertaining, but that’s about the highest praise it deserves or aims for. That’s a shame in this case, because there’s a story here that might relate something worth hearing about the state of the world, but this movie doesn’t tell that story.